Bimhuis is a charming part of the Muziekgebouw complex and is a renowned destination for events which are related to Jazz. If you do get a chance to visit it during an event then missing out on the opportunity is not advised. The place has some of the best Jazz events in the whole of Amsterdam. So if you are a fan of Jazz you will simply love this place. Prices depend on the show. Take a tram from Amsterdam, MuziekgebouwBimhuis. People normally also visit Science Centre Nemo while planning their trip to Bimhuis. 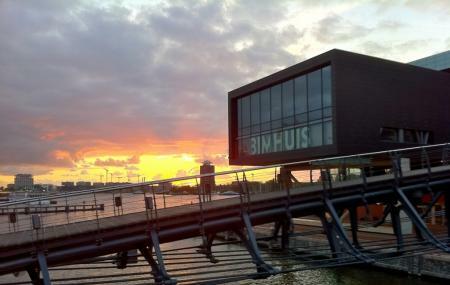 Wow, if you are a music lover you have to take part once in a Bimhuis concert. The acoustic is great and the space its perfectly made for music. Highly recommend it. They have a nice bar with anise panorama near the concert hall. Easy to access it from Amsterdam Central. Great live jazz. According to the musicians themselves it's is one of the greatest venues in the world. All the top names in the world of jazz play here. But, also a place to spot new cats on the block and local talent. Two restaurants on site and a good bar that often has good djs following the main act. Concerts start at 8.30. Sometimes there's a break, sometimes not. Unfortunately that is never listed. Main concerts end around 10.30. First time to Bimhuis.Awesome entertaining Sergio de Lope Quintet flamenco jazz on 8Feb19. Great music, brilliant musicians. Piano player - wow. So sad sound mix was pathetic. Main speakers were barely audible. Flute, piano & vocal had no presence blended with percussion & bass. Disappointing to have to struggle to hear the soloist's beautiful & emotional compliments to the ensemble. In any case, a beautiful venue. But please get a sound guy that knows how to mix.